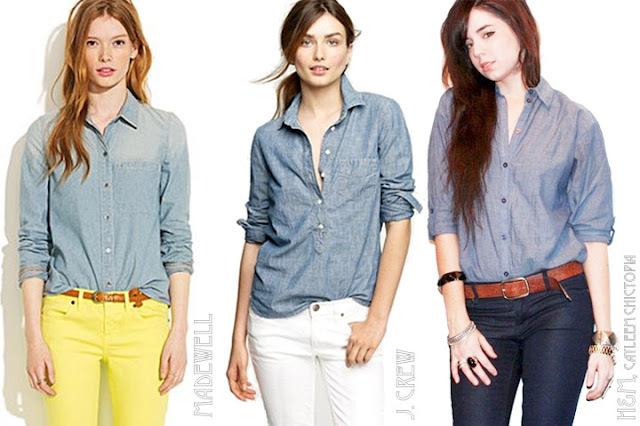 Denim shirts are THE piece to hang in your closet for spring 2012. This magical wardrobe staple can transform any article of clothing to be “so now” and goes with practically everything, not to mention a well-worn chambray shirt is super comfortable to wear. So, how do you take a denim button-up from a little bit country to uber-cool? 1. Roll up the sleeves and wear untucked with a pair of darker skinny jeans and heels or ballet flats. Let your accessories provide a contrasting color. 2. Gently tuck the front into your favorite pants. Add a rich camel belt, thin or thick, or leave your loops free and clear. 3. 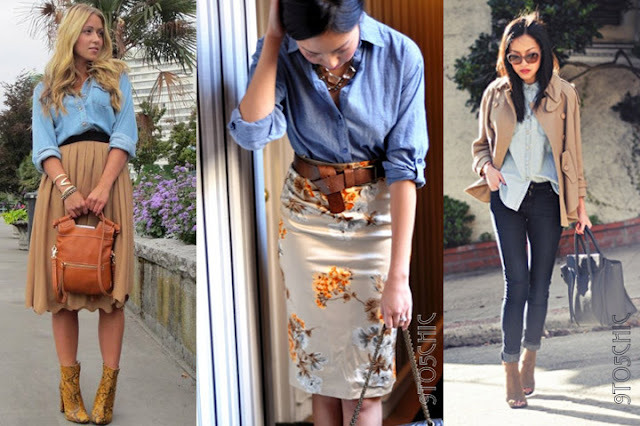 Make your denim work appropriate with a lady-like pleated skirt, a chic pencil or a trench and booties for casual Friday. 4. Jazz up the ultimate basic with sequins in the form of short skirts, maxi skirts and shiny shirts over chambray for a perfect mix of casual meets elegant. Trust me, sequins and denim love each other. Go ahead. Invest in a chambray shirt and you’ll see how easy it pairs with the rest of your wardrobe. Who knew a denim button-up could be this chic?